It contains no information pertinent to other Navigator models. Make sure the Navigator is NOT plugged into the PC at the beginning of this process. These instructions are the same for Windows XP, Windows Vista, Windows 7, and Windows 8. Your Navigator MUST be in Mass Storage mode to connect with Naviextras Toolbox! Remember! You DO NOT use Windows Mobile Device Center / Sync mode to do iGO updates! WARNING! It has come to our attention that Norton Internet Security and Norton 360 software can interfere with the smooth running of the update process. If you have either of these programs, then you should disable the Norton functionality for the duration of the update, and then re-enable it after the updates are complete. 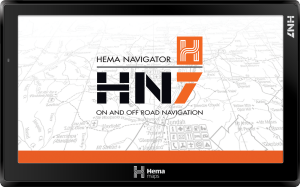 Specify your device Model as Hema Navigator HN7 when you create your account. Once you create your account an email will be sent to to confirm / activate your account. You need to activate the account from the email which is sent when you create your account before logging in. Go to the naviextras download page on the naviextras website: https://www.naviextras.com/shop/portal/downloads NOTE you cannot download the software until you have registered and logged into your account. Download the naviextras Toolbox installer program to your PC. Install naviextras Toolbox program on your PC. Make sure the Navigator is NOT connected to the PC at this point. Power on the Navigator, if it is not already on. Push the Reset button on the Navigator using the stylus. This will re-boot the HN7 to the main (Street & 4WD) page. Plug in your Navigator. REMEMBER! YOUR NAVIGATOR MUST BE IN MASS STORAGE MODE FOR NAVIEXTRAS TOOLBOX TO RECOGNISE IT. See this Knowledgebase Article for details. Start the naviextras Toolbox software on your PC. If you have had the Toolbox software installed for a period of time, you may be notified that there is a new version available to download and install. You should always update the software to the latest version if there is one available. naviextras Toolbox will detect your device, and let you know what updates, if any, are available for your device. 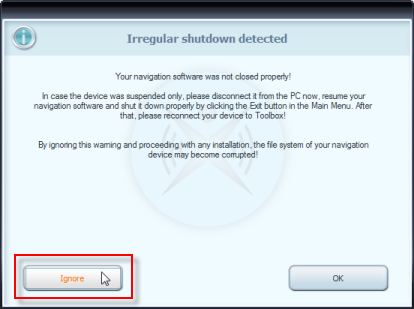 If the Toolbox displays a message indicating that your iGO software was not closed down cleanly, you can safely tap the IGNORE button to continue the process. The third button down on the left-hand side of the naviextras Toolbox window will display "Updates" if there are updates available to install. If there are updates available, click the Updates button on the left-hand side, then click the Install button to install available updates. You can also perform functions such as backing up your existing content using naviextras Toolbox. If you will be performing updates, naviextras Toolbox will prompt you do a backup prior to the updates being applied. It is recommended that you do a backup prior to doing updates. If prompted to do so, log in to your account. naviextras Toolbox options can be set so that in future sessions it will log you in automatically. If there are NO updates pending for your Navigator, naviextras Toolbox will simply show the Device button third from the top on the left-hand side of the window. If there ARE updates pending for your Navigator, naviextras Toolbox will show the Updates button third from the top on the left-hand side of the window, IN PLACE OF THE DEVICE BUTTON..
Purchasing maps for other countries? Naviextras Toolbox also incorporates a store function where you can purchase additional content, such as maps for other countries. Click the Related Article link below showing the process of purchasing additional content.